Last evening on the 10:00 PM news . We heard the breaking story . 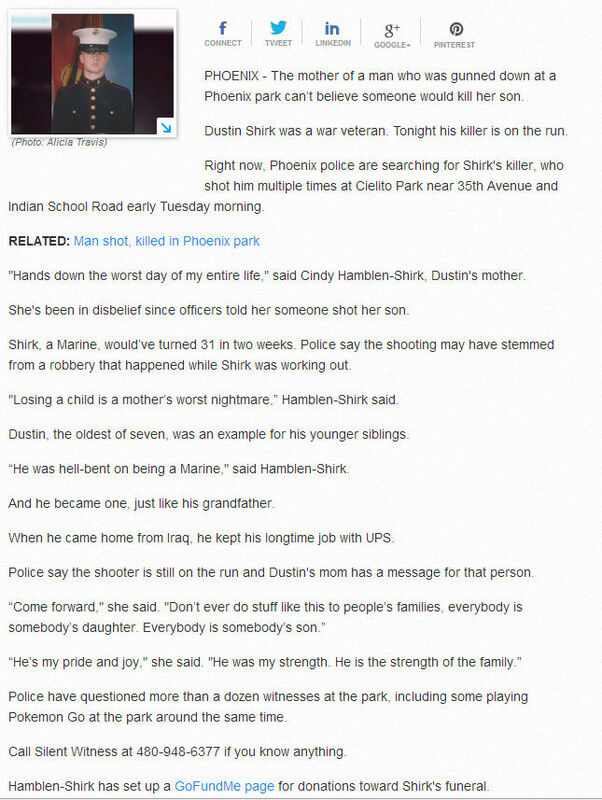 Dustin Shirk pronounced dead after receiving multiple gunshot wounds and rushed to the hospital . Dusty was the 30 year old . Oldest son of my best and longest friend of over 50 years Dave and Cindy Shirk . A fine and proud young man . Who touched everyone he met with positivity and optimism . He grew up with my 28 yr. old middle daughter Catrina .. Dusty did a 4 year tour in Iraq and was out jogging and training to return . He was also an MMA fighter . While on his jog and search for " The Pokeman Go " thing . He was robbed and killed . There has been other robberies and trouble with this pokeman thing . But this is the first murder . Very little facts are known . He was found by fellow pokemaners who called the police . This has been shocking and emotional . We just got back from the 100 mile trip to Dave's . He is having a hard time dealing with this . As is everyone . My thoughts and world is completely consumed by this at this time . I will be fine . While I was gone I let the Windows 10 do it's thing . Have not checked it out . Nor any emails or forum posts . Probably won't tonight . Very sad to hear this. The world is a terrible place and it is not getting any better. Yes Lynn this was one of my most tragic shockers . It has devastated his father to the point of no return . Most unfortunate .